Located off of Highway 53, Woodridge Estates is a very quiet La Grange neighborhood. Construction of the Woodridge Estates subdivision began in the early 2000s. Homes in Woodridge Estates range between $225,000 to about $320,000. You’ll usually find anywhere from 2-3 bathrooms and 3-5 bedrooms in these homes. The above grade square footage in Woodridge Estates houses are usually between 1,600 and 2,600 square feet. Most of the homes in Woodridge Estates are two stories, but a few are ranches. 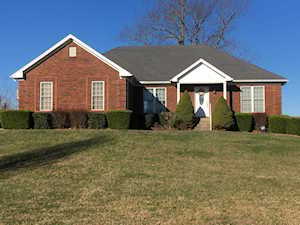 The Hollinden Team updates this search for Woodridge Estates homes on a daily basis from the Louisville MLS. We love helping buyers find their dream home! Make sure to check out The Hollinden Team's reviews. Click the map to the left to view each home for sale in Woodridge Estates. There is a satellite view button in upper right. Most of these homes have a basement and many have walkout basements. Most of the homes in Woodridge Estates are traditional style homes. Woodridge Estates isn’t really a cook cutter neighborhood. The homes don’t look too different but there are several different styles of homes to choose from. Some homes are all brick, all vinyl, brick/vinyl, brick/veneer, etc. A couple of the houses in Woodridge Estates even have a covered porch on the front of the home! If you prefer to have neighbors but not be too close to them, Woodridge Estates is a great neighborhood for you. Typically, homes in Woodridge Estates have around one acre of land per home. Grocery shopping is very close to Woodridge Estates. There is both a Kroger and Walmart within one to two miles of Woodridge Estates. For other shopping, Downtown La Grange is only about three miles away from Woodridge Estates. Downtown La Grange is a quaint shopping area filled with consignment stores, bridal stores, art museums, craft stores, restaurants, etc. For other shopping centers, you may want to travel to Louisville. The Paddock Shops is probably one the closest shopping centers to La Grange and is around 17 miles away. La Grange is home to two great golf courses, Oldham County Country Club and Eagle Creek Golf Course. Both golf courses are 18-hole golf courses that are open 7 days a week. However, Eagle Creek is public and Oldham County Country Club is semi-private. Oldham County Country Club also has a swimming pool, tennis court, and spaces to rent for parties. Woodridge Estates is in the Oldham County School District. The following schools are the home schools for Woodridge Estates: Locust Grove Elementary, Oldham County Middle School, and Oldham County High School. Oldham County Public Schools was named Kentucky’s District of Distinction in 2012. Oldham County High School is actually one of Oldham County’s Schools of Distinction. If you would like to learn more or have any questions about any of these Woodridge Estates houses for sale, or others in the zip code 40031, just click the "Request More Information" button on any property detail page. The Hollinden Team can provide you with past sale information, comparables, disclosures, PVA assessment, and tax information – we would love to answer any real estate questions you have.